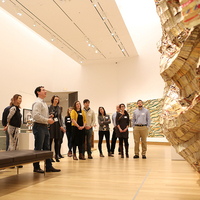 Art After Dark is a new program just for adults! Art After Dark is a new program just for adults! We will begin at 6 pm in the galleries with a series of games and competitive activities: get ready to learn about the art on view and compete against new friends. We will finish with a cash bar, laughter, and light fare in the atrium. Space is limited! Please click HERE to register by April 8. For more information, call (603) 646-1469.